Old map by BLAEU -Campus Inter Bohum et Borystenem. . . Title: Campus Inter Bohum et Borystenem. . . Size: 12.8 x 29.7 inches. Condition: In very good condition! Wide margins. Several brownish areas on margin. Few small marginal splits professionally restored. A superb, large map showing the course of the Dnieper River from Cherkasy to the estuary on the Black Sea. The map is in strip style with two vertical maps following the course of the river, each decorated with cartouches and compass roses and including numerous lengthy notations describing the cataracts, cities, salt mines, fortresses, and the historical traditions of the Kozaks. Putti flank a large cartouche at bottom. This map is based on an inset map from the important Radziwill-Makowski map of the Duchy of Lithuania (1613), which was the most accurate map of Lithuania and served as a resource for all other maps of the region for 150 years. Blaeu first published the map, along with the inset of the Dnieper River, as a four-sheet map in his Appendix in 1631. 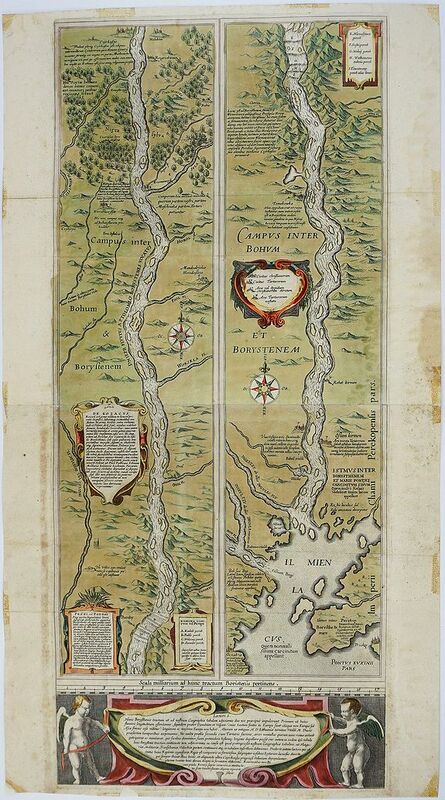 The map of Lithuania and the strip map of the Dnieper River then appeared separately in subsequent Blaeu atlases. Engraved by Hessel Gerritsz. 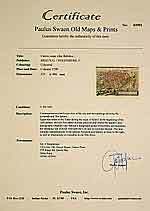 Two sheets joined, as issued. Blank verso.